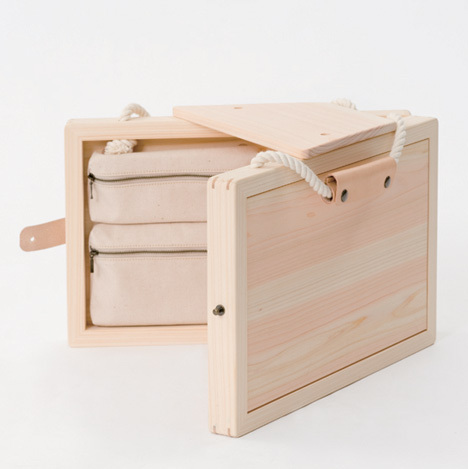 This wooden children's drawing case by Japanese designer Kana Nakanishi of Oiseau folds out to form a stool. "ABC - Atelier Book Chair"
Oiseau Inc. released a product designed by Kana Nakanishi under the brand called "mother". The product is called "ABC" standing for Atelier Book Chair. It is a portable "drawing set" that can carry drawing tools and becomes a stool. The user can take ABC anywhere they like and the place will instantly turn into one's own atelier. Oiseau Inc. established "mother" brand for its range of products. The name "mother" has a philosophy that the products should be used for a long period of time and the designer who produces them should be the "mother" of the product and consider carefully about the whole "life" of a product. ABC became the first product to be released under this brand.